Strawesome glass straws are a handcrafted and beautifully-made alternative to plastic straws. Sip easy knowing you’re making a difference with a straw that feels extra-special. 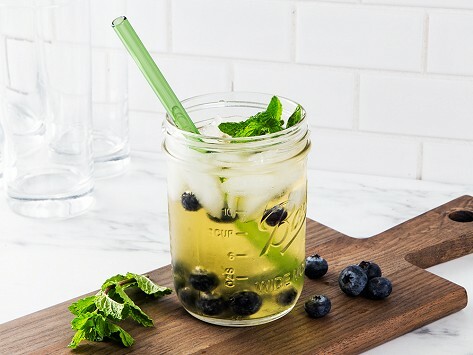 Each eight-inch straw is made in Michigan with super-durable, non-toxic borosilicate glass. This material is used in the windows of space shuttles, and can handle extreme temperatures. The straw is safe to go through the dishwasher, and because you can see through it, you know it’s really clean. Guaranteed to last a lifetime. Easy to carry in purse or briefcase, durable, and great for the environment. so pretty and comfortable to use. Feel good about doing something to limit single use plastics. What a great way to help the environment! No more plastic straws for me! Thank you Grommet! Very comfortable and convenient to use. Bought for nephew who chews thru silicon straws. Family highly recommends.